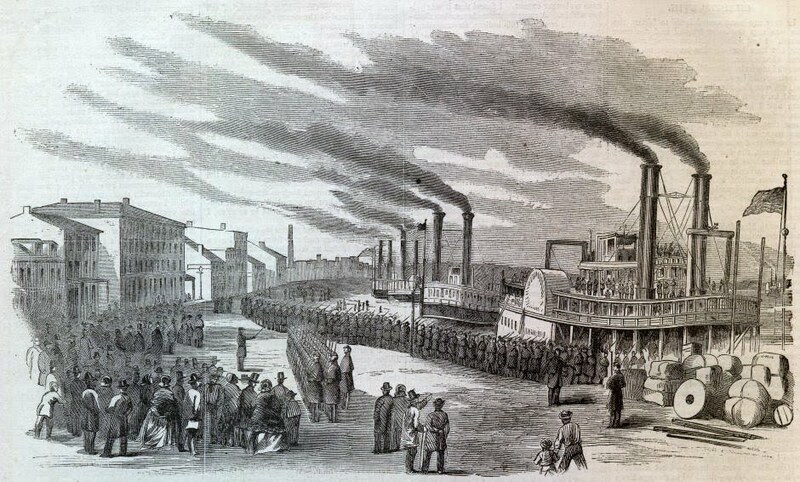 Getting back to current events in the life of the Lancaster County Regiment, the regiment's initiation into soon-to-be-replaced Gen. William T. Sherman's Department of the Cumberland began with a three day stay in Louisville, Kentucky. Opposite the Union army in that part of Kentucky were forces under of Confederate Gen. Simon Bolivar Buckner, who had recently invaded Bowling Green, Kentucky--100 miles south of Louisville--and who was poised to strike farther north. To the west, along the Mississippi River, Gen. Ulysses S. Grant was about to begin a campaign against Confederate forts that would take him into western Tennessee. To the east, Gen. George H. Thomas was organizing Union forces to drive Confederates out of eastern Kentucky. The following letter appeared in the November 2, 1861, edition of the Lancaster Inquirer. My hunch is that the correspondent, "Ipse Dixit," was Hospital Steward John B. Chamberlain, based on the content of an earlier letter and the fact that he later wrote to the Inquirer in 1862 under the alias, "Occasional." Thanks again to reader Andi Beyer for typing up this letter. Louisville, Ky., Oct 24, '61. Mr. Editor: It may be "bully" for Uncle Sam to economize in his expenditures, in these hard times; but I do think that he might have chartered another steamboat at Pittsburg for the transportation of the Negley brigade. "Elbow room" is desirable at all times, and in all places, but there's no use in complaining. On Monday evening we entered the port of Louisville, Kentucky, and a more interesting sight we never witnessed. Before us for a mile or two, as far as the eye could range on the levee, the gallant sons and daughters of Kentucky were packed to the water's edge, to fittingly greet the sons of the old Keystone state, who had come to fight secesh under Zollicoffer and Buckner, the two rebel generals. When the fleet of steamboats had all been fastened to the shore, we were greeted with a shower of grape and canister in the shape of fine large apples. For better than an hour it looked as if they intended to take the boats by storm; but the ammunition giving out, they had to withdraw. On Tuesday morning, we were moved out to one of the most beautiful groves around the city, about one mile and a quarter from the outskirts. Before the men had started, the citizens waving flags and Union emblems had completely crowded the streets and pavements in one dense, wild mass, barely leaving space for the men to pass. The "brave young lads and lasses," greeted us enthusiastically as we passed along, with the waving of flags and singing national airs. Our reception throughout to camp was a perfect ovation, and speaks well for the sincerity of the people in this crisis. Tents were pitched, and everything went as "merry as a marriage bell," until evening when a severe storm arose. It was extremely cold, and between it and the rain, the men had a hard time. The men crowded into the tents as closely as possible, to get warm. The storm strongly reminded me of the three months' campaign on the sacred soil of the Old Dominion, and the storms we encountered there. We received orders to strike tents and march to the city. The orders were complied with, although there was some grumbling at leaving such a beautiful place. When we arrived at the depot, we ascertained that Colonels Stambaugh's and Sirwell's regiments were to move off first; so Colonel Hambright moved the men off into a field nearby, and put them through the regimental drill, which was executed very satisfactorily. The men thought that they would have to go supperless; but the good Union people of Louisville had other intentions in view. Immediately in the rear of the depot, a large building is erected, where every soldier can get his meals "without money and without price." The men were greatly surprised when marched into the yard, and saw the large supply of provisions prepared for them. Most ample justice was done to the bounteous repast; and numerous and hearty were the encomiums lavished by the grateful men upon their kind benefactors - The leading gentlemen in this movement to provide for the soldiers are James Malone, Esq., President, John Graham, Dr. Goddard, John Gill, Wm Kaye, Rev. Haywood, Mr. Cornell, Prof. Holyoke, S. Dupont, Benj. Cawthorn, Wm Grunstead, Andrew Graham, Richard Cox, and William Nally. All soldiers passing through Louisville are provided with hot meals. On Thursday morning, Mrs. John Graham, formerly of Lancaster gave Col. Hambright and his officers a most splendid repast; which was most highly appreciated. Shortly afterward, orders came to embark the 1st battalion; and this afternoon the 2nd one follows in the hospital department, to join Col. M'Cook at Bowling Green, [M'Cook was at Camp Dennison, in Lancaster] Gen. Buckner has 30,000 secesh troops now in sight of that place; and I think ere long, I will have the pleasure of sending you word of our troops dislodging him. At least from the preparations now going on it does look like fight, for Kentucky must be cleared from the vermin that infest her soil and prey upon her vitals. I cannot close without paying Louisville a passing notice. It is one of the most beautiful places I have ever seen. The buildings are elegant in appearance and chaste in architecture. The people are kind, social and hospitable, worthy the reputation they have enjoyed abroad.